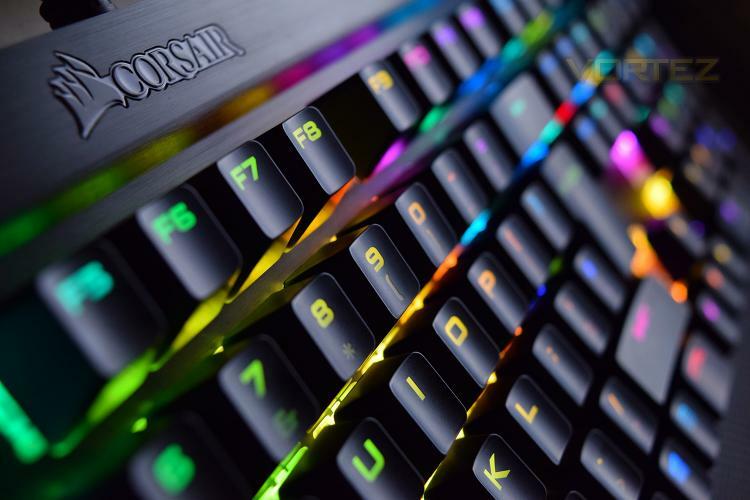 Under the microscope today is Corsair’s K70 LUX RGB. We’ve reviewed several other Corsair K70 keyboards, all of which have received huge praise. This time, the K70 comes equipped with the Cherry MX Silent mechanical keys which are up to 30% quieter than other Cherry switches. We get the usual 100% anti-ghosting, 1000Hz polling rate, per-key RGB backlighting, aluminium frame and powerful CUE (Corsair Utility Engine) software, all of which we’ve come to expect from Corsair. The MX Silent switches feature an overall travel of 4mm with an actuation point of 2mm, the motion is entirely linear with a debounce of roughly 4ms, partly down to reducing the noise output. With virtually unlimited customization directly integrated into legendary CORSAIR construction, the LUX line of gaming keyboards is the key to breaking through the competition.